The Basalt defense gang tackles an Olathe runner in the first half the Longhorns' 2018 seaso opener. Four games. Six points. Three shutouts. Yeah, the Basalt High School football team’s defense is pretty pleased with the start to its season. Basalt (4-0) opens Class 2A Western Slope League play at 1 p.m. Saturday against Moffat County (2-2) in Craig. After four non-league games, it has been the defense that has stood out for the Longhorns, ranked No. 6 in 2A this week by CHSAANow.com. That defense, led by Kim and seven other returning starters from a season ago, has Basalt feeling confident it can win its third straight WSL title, even with league newcomer Rifle (4-0) two spots ahead in the rankings. 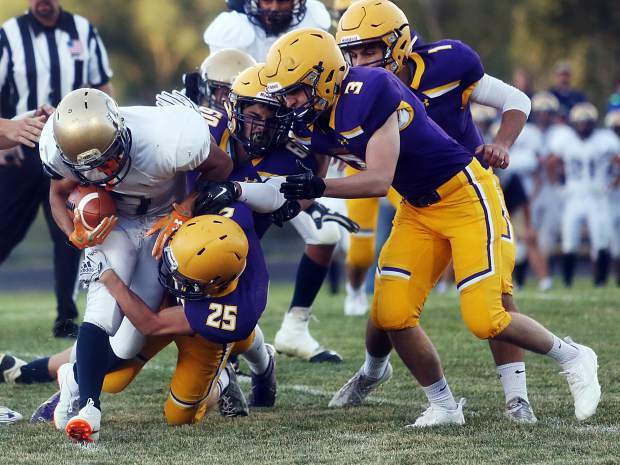 Basalt opened its season with a lightning-delayed 28-0 home win over Class 1A Olathe, which is 2-2 entering tonight’s league game with Cedaredge. BHS then beat 3A Battle Mountain, 47-6, a second quarter touchdown pass by the Huskies the only points allowed by the Longhorns this season. Battle Mountain is 4-1 entering this week’s bye. Basalt followed with a 31-0 win against Pagosa Springs (now 2-3) on Sept. 14 and a 16-0 win at Paonia (now 2-2) last week. Both Pagosa Springs and Paonia play in 1A. So, how is Basalt’s defense doing this? According to junior lineman Ernesto Lopez, it’s about trust. The experience and talent helps the BHS defense, but so does having a handful of specialists. Not many 2A teams have players dedicated to one side of the ball, but Basalt has three players — Kim, linebacker Chace Maytham and safety Henry Twitchell — who play only defense. The three shutouts match what Basalt had all of last season in shutout wins over Grand Valley, Steamboat Springs and Moffat County. The Bulldogs lost 47-0 to the Longhorns last October in Craig, and the BHS defense will be looking to do the same Saturday.